April 5th sees the celebration of First Contact Day – a day so important to the formation and identity of the Federation that it has its own movie! Zefram Cochrane’s legendary warp flight opened the door to communication between Humans and Vulcans, and that uneasy alliance eventually created the diplomatic ties that brought Andorians and Tellarites to the table as well. Not long thereafter, the United Federation of Planets was born, and in the succeeding centuries, hundreds of other spacefaring species joined the idealism of that organization. Star Trek Online celebrates First Contact Day with a special event running from 10AM PDT on April 5th to 10AM PDT on April 11th. During this event, you’ll be able to visit one of the Advanced Starship Design Bureau research facilities at Utopia Planitia, in orbit over Mars. While there, have a chat with some of the bridge officers of the Enterprise-F, which is home for a bit of testing and system recalibration. After you meet the crew, if you have not already during last year’s event, pick up your own replica of the Phoenix, humanity’s first warp-capable ship, as a deployable non-combat space craft. Once the event ends, the Enterprise will be warping off to new missions, so make sure you visit before she leaves. First Contact Day takes place in the Vulcan sector of the Sirius Sector Block, at the entrance to the Sol system. Hail Commander Winters to accept the First Contact Day mission that will reward you with your Phoenix non-combat pet. In addition to this Federation themed celebration, April 5th will also see the start of the Day of Honor holiday for the Klingon Empire! On the Day of Honor, Klingon warriors typically reflect on their actions of the previous year and determine whether or not they have been honorable. This year, however, is special year for all warriors of the Klingon Empire! The captain and senior staff of the I.K.S Bortasqu’ flagship will be inviting all warriors of the Empire onto their bridge in order to introduce the valiant crew. After you have met with the crew you will be able to pick up a Tritanium Rending Bat’leth as a gift. The Day of Honor event takes place in the Omega Leonis sector block, at the Qo’noS system, from 10AM PDT on April 5th to 10AM PDT on April 11th. You can beam aboard the Bortasqu’ from the transporter room on Qo’noS or at the shipyard. 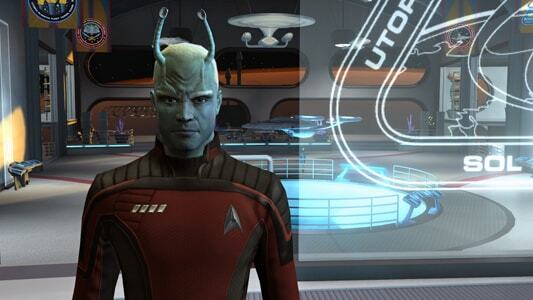 Hail Commander K’Tek to accept the Day of Honor mission that will reward you with your Tritanium Rending Bat’leth.